I like the sentiments on this bowl. This striped one is pretty. I know it's just a bowl, but... MOM!!!! Lookit where Mom found me when she got home from day hunting yesterday. This window in the living room opens onto the front porch. When Mom opens the window and the screen, it makes a perfect escape route for me if somebody comes on the porch when I am already there. It also makes it possible for me to enjoy the front porch any time I want. More, More and MORE Plants! OK, Here are the other plants that came in the mail the other day. These are for planters for the front yard. and two to flank the entrance to the carport. Mom thinks some creature got to this one because one of the plants looks like it got crushed. Oh well. We'll see. The stuff Mom had in planters on the front porch steps last year didn't make it through the winter. Mom was a bit bummed, but went to the local garden place and after a lot of thought came home with all this. I think Mom is happier with these planters now. All these things like "part sun, part shade" and will grow to be very pretty and colorful. Even I think these are going to be very pretty. Hey, check this out, this was the shade garden exactly a year ago today. Mom was planting it. This was taken this morning. What a big difference! 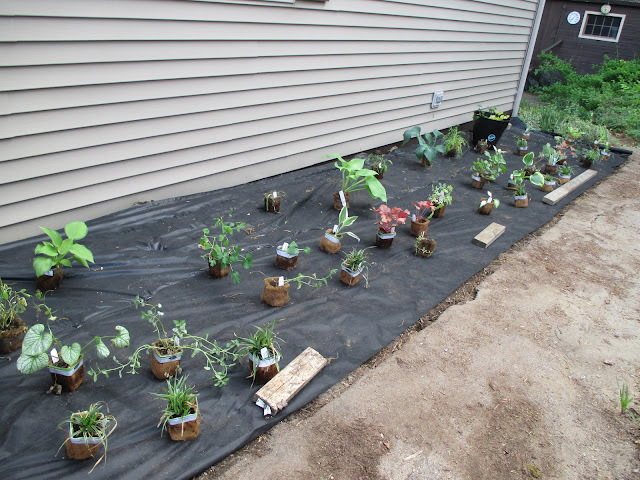 Mom has added a couple of things, and shifted a few plants around. Everything looks really good, and Mom is very happy. Well, maybe not. Mom went to the Big Box store and brought back these herbs for the vegetable garden. Remember Mom got Lyme Disease last year and wasn't able to do much with the vegetable garden, but this year she has made up for it. Here is Parsley and Dill, Basil and Thai Basil. They joined the Rosemary, Thyme, Oregano, Chives, some Basils and Tarragon that Mom has already planted. In the corner under the carport, Mom has put some other planters of pretty colored shade loving plants in containers, partly so visitors won't walk into the big wind chime we have hanging directly above. Mom also planted the Mint plants on the other side of the house. That area really needs work. There is kudzu back there, and it will take a lot to get rid of it, or to at least beat it back. The back yard is a real mess and Mom will work on that last. Mom is two years into a five-year plan for redoing the landscaping of the house. Now she thinks it might be six year plan. All the plants she planted in the shade garden are doing very well, but that's because she had good dirt put in. She has lost some stuff she planted in the front yard, so she knows to fix that she has to put good dirt out there too. Still though, it's a good start. Mom has contracted an exterminator to spray the yard for ticks and mosquitoes throughout the summer, so she won't have to worry about that again this year. Me? I'll be on the front porch. So here is the picture of the Shade Garden I wanted to show you yesterday. It is really looking good. Mom is very happy. She went out last night and bought dirt and a very big pot. AND she brought home MORE PLANTS!!!! These aren't them. These are for the gigantic pot she bought, and they are going out in the front yard. Mom has been working in her garden, and of course I have been snoopervising. Every day this week, the man in the bloo shorts or Mr Brown has brought boxes of plants. This is twenty mint plants for the studio side of the house. It doesn't get much sun, and it's kind of ugly there now. Mom wants the Mint to take over and give her a lovely "sea of green" to look out at when she is in the studio sewing. Plus it will smell nice. These plants will fill in the empty spots in the shade garden. Actually, it's funnier than that. Mom was surveying the garden one morning and noticed that three of her Hosta plants were not coming up. So she ordered replacements. Guess what "came up" after all!! So now we have a few extra and Mom has to figure out what to do with them. This doesn't look like much, but it's Thyme, Rosemary, Tarragon, Sage and Oregano. Mom's got to plant seeds for Basil, Parsley and Chives this weekend. She will also plant Kale and Arugula and lettuces. I have other picture I want to show you, but they are stuck somewhere on the innernets so they will have to wait. In other news, Mom and I have made plans to visit our Mary-land family. I am so excited. I am NOT going to get into this bag. I just want to smell it. Mom is furry excited about her shade garden on the side of the house. Everything is coming up and it is looking good. It will take another year for the plants to fill out to their full size, and she is enjoying watching it. Me, I like watching the Cardinals (noisy red birds) while I sit on the front porch. Happy Mother's Day, Mom. I don't sit on your lap much, but today is special, so I'll indulge you. Mom took this selfie of the two of us. She was sewing the binding on a quilt, and I wasn't getting quite the attention I wanted. It was sunny and warm yesterday so I spent a lot of time on the front porch, but today it is cooler and cloudy, so I am in my tent.